Although efficacy of endoscopic cystogastrostomy for pancreatic fluid collections is reported, few stents dedicated for this purpose are commercially available. We evaluated a newly developed, short metal stent with wide lumen diameter customized for cystogastrostomy in 9 cases. Technical success rate was 100% without early adverse events. Direct endoscopic necrosectomy through the stent was successful in all 3 attempted cases. Stent removal was achieved without difficulties in all 6 cases. The placement of this metal stent in the treatment of pancreatic fluid collection may prevent complications such as migration and peritonitis. A wide stent lumen enables direct endoscopic necrosectomy through the stent. 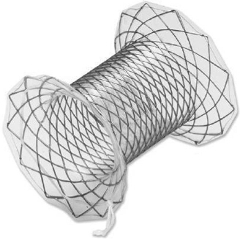 A plastic stent has been commonly used for enterocystostomy. Endoscopic treatment for pancreatic fluid collection including necrosectomy is technically feasible using this new metal stent. The safety, efficacy, and indication should be evaluated in larger prospective studies.